We were up really early on the last day or maybe I just hadn’t really gotten into a deep sleep. We packed up and headed out of the park where we spent the night, depositing our payment on the way out. I thought about waiting for staff to show up and would have if that didn’t mean waiting around for hours so we drove off into the early dawn. Normally I follow most rules (I’ll admit that I’m not good with leash laws if no one is around) but with New York state’s two dog maximum I’ll keep our camping location to myself. As we entered Ogdensberg, I noticed a park beside the road and an expanse of water beyond it. We had left Lake Ontario far behind and were now on the shores of the St. Lawrence River. I stopped to let the dogs run and even this early, the little monsters still went to splash in the water. Oh Jack. You can’t just lean over to drink can you? Piper seemed to be moving easier this morning but I didn’t want to stress her out so play time was short. When we were all back in the car, I began looking for a place to grab a bite to eat and a coffee. Then it hit me: it was July 4 and everything on this side of the St. Lawrence River was closed. Second big face palm of the trip. Well then, into Canada we go. One advantage to driving on a national holiday is that traffic is light. We were driving down some lonely road and I noticed a bunch of cars parked next to a lake, so I thought that this required a stop to investigate. 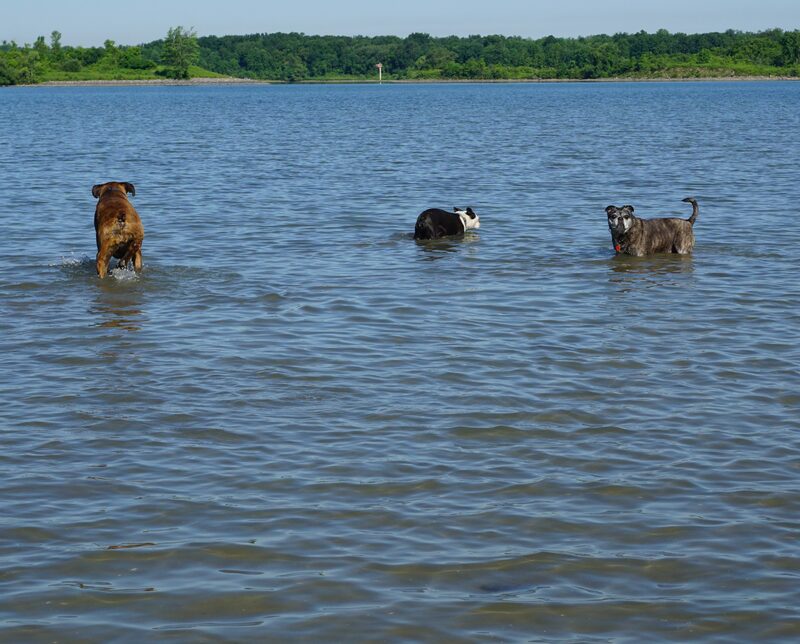 A sign said that it was the Long Sault Dike but all I saw was a sandy beach, some open water, and dogs playing. When we showed up, the people that were there before us were gathering their dogs to leave so it was perfect timing for us. The dogs were released from the car and did what they do. I tried to keep Leo interested in some sticks to tire him out but he wanted nothing to do with them, content to roll his way everywhere. 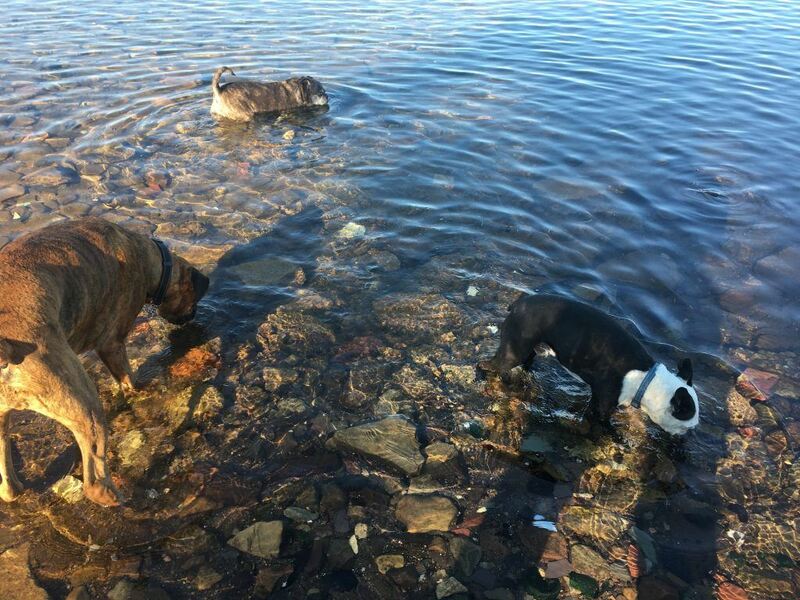 Piper and Jack waded chest-deep into the water to drink and then stood next to me until I turned to go back to the lot. Once everyone was back in the car we continued our way east. 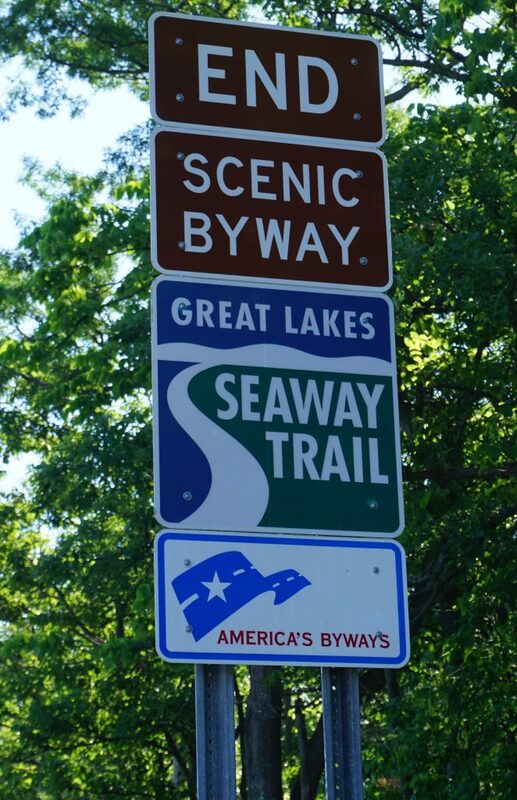 We weren’t driving long before we came to the end of the Great Lakes Seaway Trail and the end of this portion of the trip. There was nothing else to do but turn the car north and head back into Canada. We crossed the border at Cornwall and I don’t know if the dogs were an adorable distraction, but this was one of the most relaxed crossing yet. I think we spent more time driving over the river than actually at the booth. As soon as we crossed, the first order of business was food and we drove into downtown Cornwall. I was a little disappointed that everywhere I looked was paid parking and none of the spots were anywhere close to a restaurant. Finally we found Mindful Cookery & Food Market which has a large lot nearby. The lot was a paid parking lot but I took the chance that we wouldn’t be there very long. I brought the dogs with me and tied them in front as I ran inside to order some precious caffeine and a breakfast of bacon and eggs. Fortunately my food was ready very quickly and we walked back to the lot where we had parked. I have never seen a parking lot with a patio but here one was. It was perfect to sit down and enjoy a meal rather than squished into the car or sitting in my truck. We sat in the shade and ate our breakfast while we watched people walk by. Once we were bored of people watching, it was time to get going. Rather than drive Highway 401 west, I stayed on Highway 2 which is slower and gives a better view of the river. 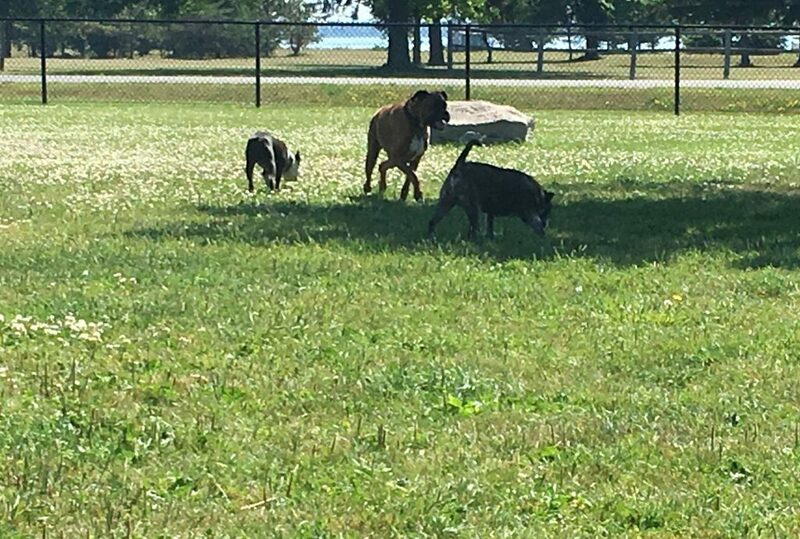 Luckily it also gave us the opportunity to find South Dundas Waterfront Dog Park in Morrisburg. Even with the breeze off the water, it was still a hot day and the dogs did a couple of laps of the park before sitting in the shade. It is a nice park to visit and is easily accessed from the 401 the next time we’re passing by. It’s nice seeing such lush grass in a dog park. Contining west on Highway 2, I thought about stopping at the Battle of the Windmills Historic Site, just so that I could get some learning in. Then I thought about dragging the dogs out of the car and into the heat and I decided against it. 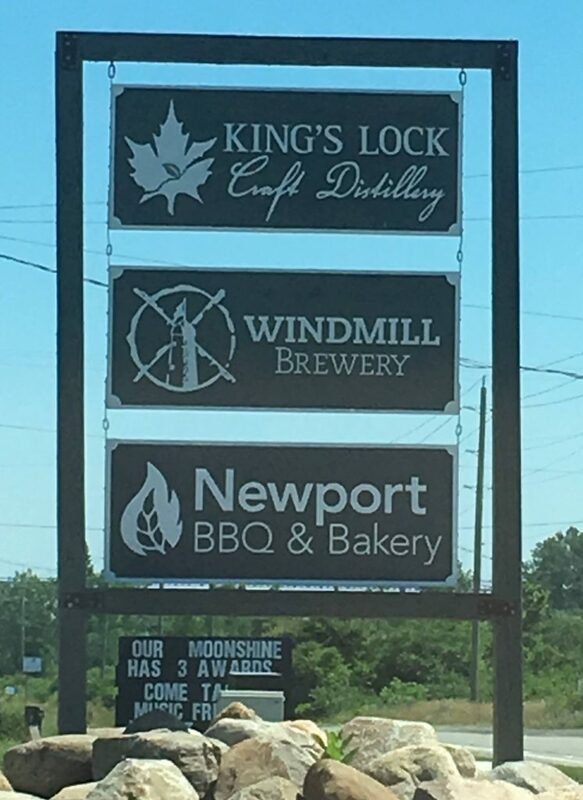 However, when I saw Windmill Brewery, well that’s something that maybe we can all enjoy: I get beer and they get air conditioning and extra love. I popped in and asked if I’d be able to bring the dogs inside. The woman at the counter said I’d have to ask someone else then said it should be OK since he wouldn’t like them being in a car on a day like today. Ummmmmm I wasn’t planning on sipping a beer and leaving the dogs outside. In the car. The gentleman working said that the dogs would absolutely be able to come inside and they both came with me as I went back to the car. I perched on a stool and in short order the dogs were sprawled out on the floor while I sampled a few of the wares. The shandy was amazing but they didn’t have any cans so I bought some of the pilsner to take home. The only movement from the dogs was when someone came in. There was a flurry of activity and then back to Napsville. Maybe we spend too much time in breweries. And wineries. And patios. On a whim, I entered the address for home into my phone to see what route the phone would suggest. It directions that took us through Newcastle which I had never done before. Plus, I was starving and needed food. Like now. I stumbled across Da Taste, a Jamaican restaurant, and instantly thought “YES!”. In fact, I think I said it out loud. I popped in and ordered the jerk chicken with rice and while it was being made, I took the dogs to the pet store next door. They got some love, some treats, and some treats to take home before I ran to grab my food. My plan had been to wait until I got home to eat. That didn’t happen. As I drove by a loading dock, I thought “this is going to do” and parked the car in the shade. When I opened the container, the aromas wafting up was intoxicating so I had a little nibble on some chicken to tide me over. The little nibble turned into a feeding frenzy of one. 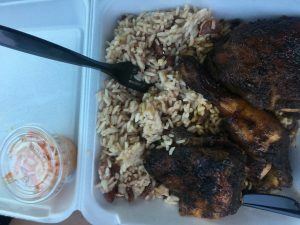 This was by far some of the best jerk chicken I have ever had and I ate almost the entire container. It was spicy so the dogs didn’t get any even with all the guilt-inducing looks I got. Satisfied and no longer hangry, I drove the car north to home. I was craving jerk chicken for weeks after this. The dogs knew where we were as soon as we turned down our road and were whining to get out of the car. Piper missed her cat, Jack missed his trampoline, and Leo missed the basket of toys that he likes to leave everywhere. As much as we like travelling, it’s always good to be home. It wasn’t until the next day later that I realized what was wrong with Piper. In 2016, she had an episode of Old Dog Vestibular Syndrome, which kind of sort of resembles a doggy stroke. Well it turns out she had another episode while we were travelling which explains why she didn’t want to get out of the car. I had assumed she was sore but in fact she was feeling disoriented and off-balance. I knew what had happened because for Piper, the biggest indication is a complete lack of balance on the smooth floors at home. I winced every time she scrabbled her way across the floor, dreading that she would hurt herself. Fortunately, she recovered and after a few weeks, she was back to her old self. Just in time for the last leg of the Great Lakes Road Trip. Want to read about how we ended up at all the points on the map below? Check out the start of this leg of our trip here. Or follow this link to go all the way back to the beginning of our Great Lakes adventure. 2 response to "The Great (Lakes) Escape – Four Lakes Down"